The Black Prince is a British tier 7 heavy tank. 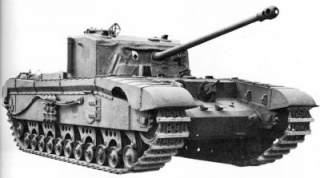 The Black Prince is essentially an elongated, widened, up-gunned, and somewhat up-armored Churchill VII. 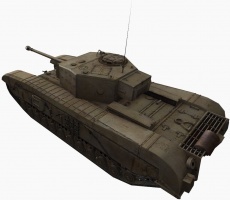 While the powerful engine makes the vehicle respectably agile while maneuvering, partially due to its excellent terrain resistance, it retains the terrible cruising speed of the Churchill VII, traveling at a maximum speed of 20 kph. The tank's first engine is woefully inadequate, and must be upgraded. The Black Prince features very thick but very flat front and side armor that must be angled to be effective. Even some higher-tier tanks will have trouble penetrating an angled Black Prince without the use of premium ammunition. Under NO CIRCUMSTANCES WHATSOEVER must the Black Prince be driven into an open area, because its size and speed makes it an easy target for artillery and tank destroyers. When ported to HD, the tank suffered a reduction in its frontal turret armor, making it somewhat less effective. However, its good armor and excellent hit point pool make it a tough adversary when driven by a skilled tanker. The Black Prince leads to the Caernarvon. Low tiers will struggle against the armor. Tracks absorb a lot of damage; sidescraping can be effective. Armor is very effective when angled. Good rate of fire, accuracy, and depression (-8°); good when hull-down. Worst Alpha and penetration amongst T7 heavy tanks. Second worst DPM amongst T7 heavy tanks. Extremely painful grind to research this tank from the Churchill VII. Armor is very flat and will struggle to withstand even concurrent tanks (like Tiger 1). 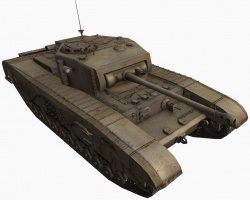 The Black Prince has a similar playstyle to the preceding Churchill series of tanks. 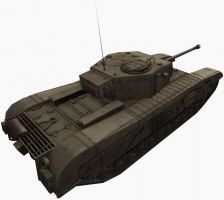 It used to be the only tank of the Churchill series that had working armor, but sadly the HD transformation did change that. Not to mention that credible threats will simply load gold and easily penetrate your average armor. 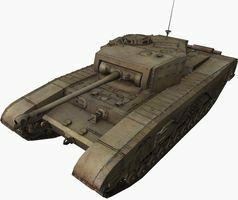 Unlike the first two UK heavies, the Black Prince has better agility than it seems on paper (most likely due to its better terrain resistances), and when used tactically it can make a brawler in a pinch, though it is generally a better idea to avoid close combat in order to fully utilize the advantages of your gun, what little there are. It is vital especially in close quarters to angle your armor, preferably slightly to the right at around thirty degrees. If you can jam your front end against a rock or other cover with just your sharply angled side and your turret exposed to enemy fire, you can also become a frustrating blockade for any tank at your tier (this tactic is known as sidescraping). While the Black Prince's armor can often bounce shots from KV-3' and IS's 122 mm gun.. Note that once you're set in a direction, it will be rather difficult to backtrack as the Black Prince's awful top speed won't get you there in time; instead, you should consider where your allies are going and where you can be of most use. If you are close to the bottom tier, stick to the second line and provide support with the accurate 17 pounder, which can penetrate weak spots on most high tier tanks easily thanks to its great accuracy and aim time and good penetration with premium rounds. The damage will seem lacking but the rate of fire is acceptable and the gun will drain all but the largest health pools in a short time. Be ready to take the initiative though and to lead an assault through where the enemy lines are weak. Given the fast reload of your gun, you can charge through enemy fire and get into their faces as your allies follow you up. No matter what the fight, don't stray too far from your support. The Black Prince can fight a lot of opponents and win head to head, but if you enter combat with more than one agile, well-armed tank in close quarters your chances of victory plummet. Shots to your exposed sides and rear carry a high chance of injuring a crew member, track your tank, or worse destroy your ammo rack. This will more than double your reload time and make your cannon far less potent due to its low alpha damage. Despite it's flaws though, Black Prince is basically a TOG that has thicker armor, more health, a tier higher, more mobility, and the same gun. So if you like the TOG, this is for you. When put into tier 7 battles, it is usefull. Above that not so much, the 17 Pdr has no business being on a Tier 7 heavy tank. The OQF 77 mm Gun Mk. II gun was only used on the Comet tank. It was never developed for the Black Prince. The Rolls-Royce Meteor engine was never developed for the Black Prince. Actual top speed is 16.9 km/h, not 20 km/h. This page was last modified on 19 April 2017, at 10:02.